As the pattern of Uptown muggings slows and moves slightly downriver, another robbery at gunpoint was reported Sunday evening in the Irish Channel and a carjacking was reported Monday morning in Central City. At 9:15 p.m. Sunday, a woman walking from a Magazine Street restaurant had reached the 3300 block of Constance when she was approached by two men with a black semiautomatic handgun who demanded her purse and cell phone, said Lt. Troy Savage of the NOPD Sixth District. The men were described as 5-foot-7 African-Americans in their late teens, both wearing white undershirts, one with khaki pants and the other wearing camouflage shorts. The carjacking was reported about 11 a.m. Monday at the intersection of South Liberty and Terpsichore, where a man was getting out of his car when he was approached from behind by a gun-wielding stranger, police said. The gunman demanded his money and keys, then took off in his car, a four-door blue 1998 Honda Civic with damage on the rear driver’s side panel near the gas tank and a missing Honda emblem on the trunk. The gunman was described as a 6-foot-2, 180-pound dark-skinned black man with short hair in his late 20s, wearing a blue-and-white striped short-sleeve shirt and blue jeans. Anyone with information is urged to call the NOPD Sixth District investigations unit at 658-6060 or, to leave an anonymous tip that could lead to a cash reward, call CrimeStoppers at 822-1111. 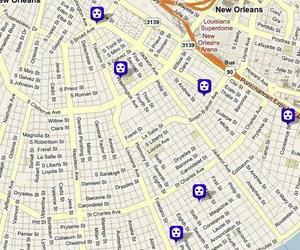 After the rash of violent robberies in May in the NOPD Second District, which runs upriver from Louisiana Avenue, the only robberies in the last two weeks (except one investigators have since deemed “unfounded“) have been in neighborhoods of the adjacent Sixth District, between Louisiana Avenue and the Highway 90 overpass, including the Garden District and Lower Garden District. That was my friend who got robbed on Constance @ 9:15pm. She is a young up and coming chef who works long and hard hours for her money and for the love of cooking for New Orleanians, and to be robbed at gunpoint while walking home from dinner, it just begs the question, how do we stop muggings? What can the cops do? I imagine the police force is super nervous, all it takes is one mugging gone wrong and they’ll have a body on their hands. Do they up patrols? Do they put a plainclothes officer on the streets… what? We originally reported it Sunday afternoon (http://uptownmessenger.com/2011/06/early-morning-armed-robbery-reported/) but police have since deemed the complaint “unfounded,” as you can see from the more current link above. NOPD crime log says this happened at 5:21 pm, not in the middle of the night like the previously reported one. or do you think that the NOPD just screwed up the time here (which, of course, would be shocking)? I actually noticed that myself after my reply to you. I bet it’s going to be a reporting issue – maybe something was done to the file (ie being marked “”unfounded,” but really anything) that caused it to be recorded at 5:21 p.m.
That’s just speculation on my part, however. I’ll find out for sure at tomorrow’s Second District COMSTAT meeting, open to the public (noon at Children’s Hospital). And the time it happened was the original dark-of-night time first reported; that 5:21 pm was the time the record was changed in the system. Thanks again for bringing this up. I’m sure a number of people were wondering. i see. thanks a lot for the great sleuthing!